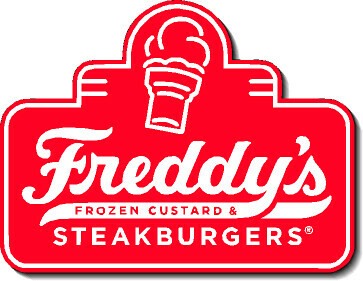 San Diego recently became the home of another beloved Midwest fast-food chain: Freddy’s Frozen Custard & Steakburgers. That name is a mouthful, and since I’d rather have a mouthful of their fish sandwich, from here on I’ll refer to them as Freddy’s. Freddy’s has two San Diego County locations at this writing— San Marcos and National City. I was recently in National City for another food-related pilgrimage (rhymes with “Blunkin’ Blonuts”) and spotted their seasonal, participation-may-vary window dressing for their fish & chips basket or sandwich. It’s my solemn duty and privilege to report on fish sandwiches for my better half, so $5.50 later I had me a new sandwich to try. Their sandwich is a bit of an odd duck. 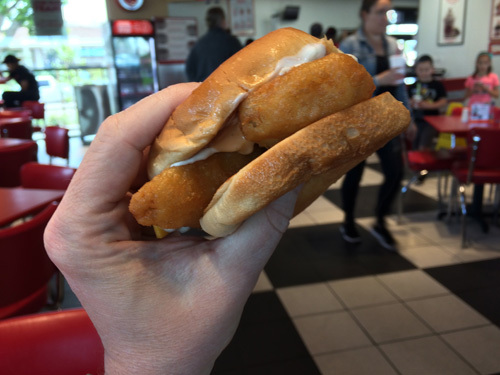 Rather than the usual solitary breaded-and-deep-fried quadrangle slab of Alaskan cod, it’s actually two triangles (think elementary school lunch) with a melty slice of American cheese and some “Freddy’s Sauce” in a toasted bun. It comes with a couple of packets of Heinz tartar sauce, which I think is pretty low on the scale of tasty tartar sauces. Overall it was OK, not really a standout either way. I didn’t mind the fish planks; they flaked apart easily so they weren’t over-fried or dry. I can’t determine what made the sandwich so sweet, though. 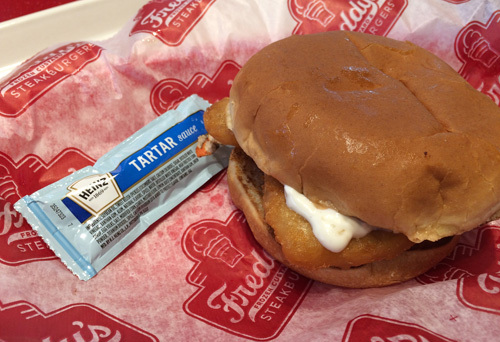 Might have been the tartar sauce, or the Freddy’s sauce… maybe a combination of the two. I wish I could give you a round-up of calories, sodium and fat grams, but Freddy’s doesn’t have any nutritional information for this sandwich or their basket on their website (the basket comes with shoestring fries).